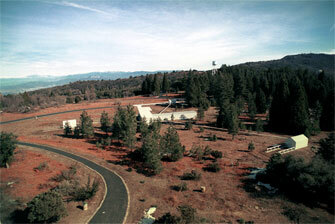 The Palomar Testbed Interferometer (PTI) was a near-infrared, long-baseline stellar interferometer that was located at Palomar Observatory in California. First fringes were obtained in July 1995 and it was operated until December 2008. PTI's development and early operations were carried out by the Jet Propulsion Laboratory (JPL), California Institute of Technology, with funding from NASA under its TOPS, ASEPS, and Origins programs, with additional funding from the JPL Director's Discretionary Fund and the JPL Director's Research and Development Fund. Subsequent science operations were carried out by NASA Exoplanet Science Institute (NExScI), California Institute of Technology, with funding from NASA, the PHASES project, and the Infrared Processing and Analysis Center (IPAC). PTI had three 40 cm apertures that could be combined pair-wise to provide baselines to 110 m. The interferometer actively tracked the white-light fringe at H and K bands, using laser-monitored active delay lines, with angle tracking implemented at R band. The instrument was highly automated, allowing for a high observing cadence. Many of the technical approaches developed at PTI have been applied at the NASA Keck Interferometer. PTI was also used to measure the sizes of dwarf, giant, and supergiant stars, the sizes of emissive regions around young stellar objects, and binary and multiple star orbits, both from visibility measurements and PHASES astrometry. It was the first interferometer to have directly measured the diameter changes of a Cepheid variable star, and to have directly measured the rotational oblateness of a rapidly rotating star. NExScI support for PTI, including the publically available PTI data archive. A brief picture tour of PTI.